Hortus Camdenensis | Veronica bidwillii Hook. A procumbent veronica somewhat similar to Veronica nivea Hook.f., which see, but with larger leaves, the flowers white streaked with pink. 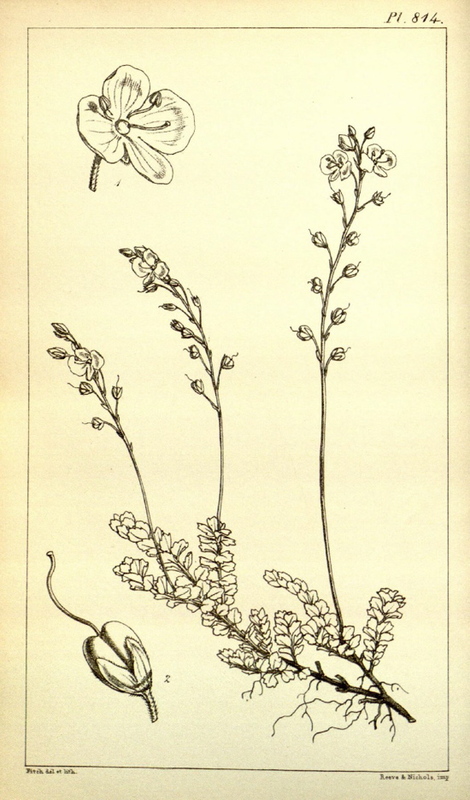 The identity of Macarthurs ‘Veronica sp. (New Zealand)’ is uncertain but is probably either Veronica nivea Hook.f., which see, or Veronica bidwillii Hook. described here. ‘Hab. Bed of the River Wairau, New Zealand, about 2,250 feet above the level of the sea, Mr. Bidwill (n.15). Quite a new Veronica, from a country eminently rich in species of the genus. Its nearest affinity is V. nivea, Hook. fil., supra, t.640; but that has much larger and much crenated leaves, procumbent, but not creeping stems. […] The flowers of V. bidwilli are described by its discoverer [John Bidwill] as white, streaked with pinkish-lilac lines.’ [HIP vol.9, t.814/1851]. Listed in the 1850 and 1857 catalogues [T.986/1850]. See also Veronica nivea Hook.f., a possible identification. Whatever the identity of ‘Veronica sp. 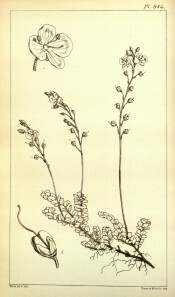 (New Zealand)’ Macarthur certainly received his plants from John Bidwill and may well have grown this plant in his garden before the species was botanically described.